The NAT-MCH can be comfortably equipped with different Fat Pipe Fabric modules for PCIe Gen 3, SRIO Gen 2 and 10GbE (XAUI) fullfilling the demand for high performance data paths within a MicroTCA system. Different clocking options provide all clock signals for telecom and non-telcom applications. These flexible configuration options make the NAT-MCH the ideal choice for any kind of application. NEW: NAT-MCH in double-width with µRTM COM Express Carrier available! The Clock Mezzanine Module allows a flexible selection of the telecom and non-telecom clocking structures as defined in MicroTCA.0. 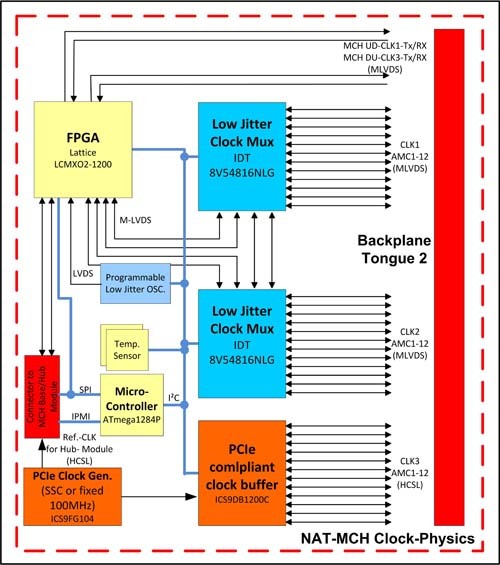 The on-board Stratum 3/3E type PLL sources its clock reference configurably from either any of the 12 AMCs or from an external clock via the front panel BNC type connector. 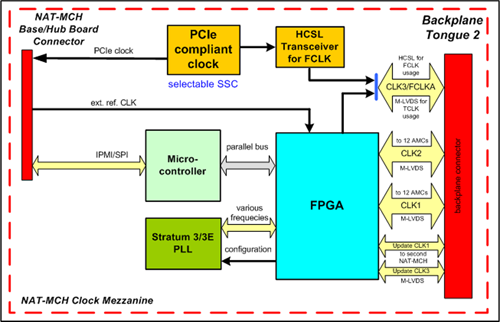 In conjunction with the PCIe Hub module it provides a PCIe compliant fabric clock (FCLKA) to all AMC slots. This can be either a 100MHz fixed or 100MHz Spread Spectrum clock (SSC) at HCSL signaing level. Beside the standard clock mezzanine, N.A.T. offers a clock mezzanine for Physics. The development of this module is driven by the demand of physics groups requiring very low jitter and constant latency. These features are realised by using a special Clock Multiplexer developed in cooperation with IDT (Integrated Device Technology Inc.). 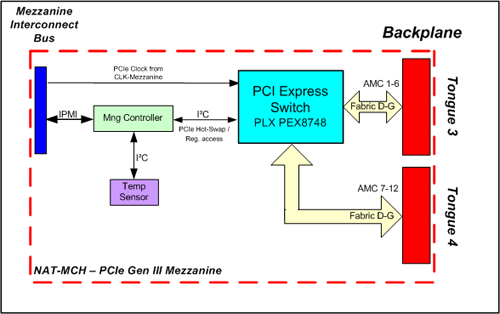 The PCI Express Switching Mezzanine is an AMC.1 compliant module for the NAT-MCH that enables users to add scalable high bandwidth, non-blocking interconnection to a wide variety of applications including servers, storage, video streaming, blade servers and embedded control products. The PCIe Hub module supports full non-transparent bridging functionality to allow implementation of multi-host systems and intelligent I/O modules in applications such as communications, storage and blade servers. 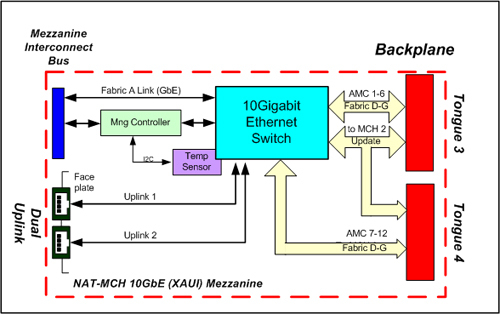 The NAT-MCH 10 GbE Hub Mezzanines provides high performance, low latency and robust Ethernet packet switching service for MTCA systems. 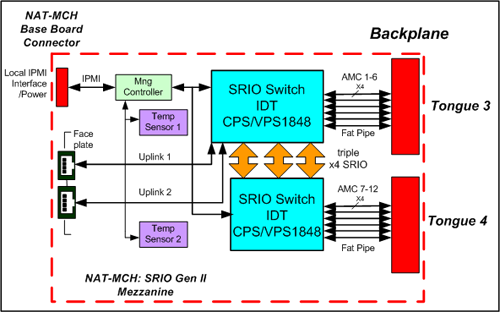 The SRIO Gen 2 Mezzanine module provides a non-blocking high performance data switching functionality for up to 12 AMCs. The non-hierarchical structure of SRIO allows for superior bandwidth data communication between each end point. Additonally, SRIO data integrity and health checks are performed by hardware. 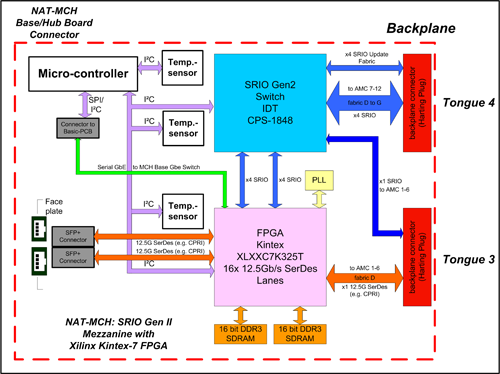 The NAT-MCH-FPGA combines the above described SRIO Gen 2 switching features and a fully-customizable Xilinx Kintex-7 FPGA. This special FPGA hub module is intended to be used for switching or multiplexing CPRI, OBSAI, as well as other standard protocols (e.g. SRIO, XAUI) or any fully customized serial protocol. The new double-width MCH can be used as a standalone product in all systems requiring the double-width form factor. It is ideally suited for MTCA.4 applications allowing the use of MicroTCA rear transition modules (µRTM). Combining this MCH with the µRTM COM Express Carrier, allows you to use the unused space behind the MCH. The COM Express carrier can be equipped with any Type 6 Computer on Module (COM) Express module that suits your system requirements. The benefit of using COM Express modules is the broad range of configurations (processor architecture, performance, memory, etc. ), a rich offering by various manufacturers, long-term availability and system configuration flexibility. or contact us using the contact form. Thank you. If you are looking for any specific order code in reference to this product please browse our product section (NAT-MCH) or contact us using the contact form. Thank you.